Choose from an extensive collection of metal wind chimes, all sorts of colourful glass and resin items plus traditional bamboo wind chimes. There are videos or sound clips for most of our products to help you select your ideal chime. You'll find some spectacular windspinners for your garden, plus some really pretty sun catchers, rainbow makers and dream catchers to hang in your home. You've probably not heard of most of the brands, so take a look at our Brand Comparisons: you'll find relative pricing information for similarly sized "classic" wind chimes, plus a few other key features which should help get you started. An additional service available for selected items. 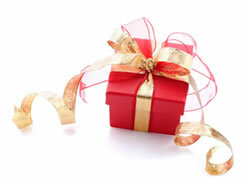 Tick the Gift Wrap box just above the Add to Basket button for your chosen product. If the product you want to buy doesn't have the gift-wrap tick box, please call or email us to enquire about a "special". Enquiries are most welcome: find out more about our service. Free delivery only extends to the UK. For deliveries to Europe, select "Europe - courier service" from the list of Delivery Options at the checkout. For countries outside Europe, we will notify you of the additional cost by email and send you a link which you can use to pay for shipping.